Darling Downs brothers Laurie and Jim Black will hang up their work boots this year after half a century of farming. After starting out at Brookstead property Cecilvale in 1963 and growing the business on the back of broadacre crops, they are ready to pass it all on to the next generation. “Jim and I are retiring after this crop because we’ve been farming here for 51 years in April, and we want to give Jim’s son Peter and grandson Matthew the opportunity to do their own thing,” Laurie said. While admitting it has been the worst season for Queensland farmers in a decade, Laurie said this had no bearing on his decision. 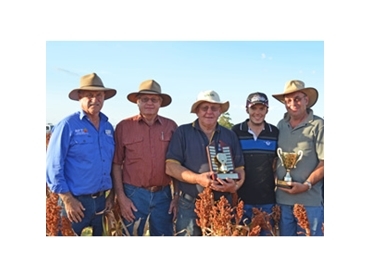 Ultimately, he is leaving on a high note, he said at the annual Black’s and Pacific Seeds Field Day last week. The Black family partners with Pacific Seeds every year, growing a trial site at Cecilvale among their broadacre crops so people can review old and new varieties planted in various agronomic situations. Laurie and Jim hosted grain growers, merchants and agents for the last time last Wednesday, taking them through their sorghum and corn paddock. “Each year we invite industry people to have their agronomy and marketing questions answered about new and upcoming varieties. Mr Black said this year they planted MR-Buster and MR-Taurus on the block surrounding the trial plot – both emerging well considering the limited rainfall. “It was long fallowed ground so it had good stored moisture. “It was incredible that while we received close to our average yearly rainfall of 26 inches (they received 24 inches), it all fell in the first half of the year and very little after, causing planting to be delayed until late November. Asked what the key to working the same land year after year was, he said you have to be innovative or perish. “While several improved traits have been bred into the new varieties of sorghum, the biggest cause of increased yield has been improved agronomic practices. More recently they purchased a strip tillage machine to address issues with nutrients in the soil. “We have conducted soil tests here in recent years, having noticed our yields were down because of reduced subsoil fertility. Phosphorus, potassium and sulfur levels were restored and yield increases should be expected. Reflecting on his time at Cecilvale, Mr Black said the good times outweighed the bad and one crop in particular helped their business thrive. While the brothers will not be growing sorghum, corn, cotton, chickpeas, wheat or barley any more, the Black family tradition of innovation will live on for many years to come.